During the Pennsylvanian period (300 to 320 million years ago), this area was part of the Paradox Basin, a giant inland sea that dried up intermittently, leaving behind a thick accumulation (5000 feet, 1525 meters) of layered marine salt. Loading by deposition of subsequent Permian through Triassic layers caused the ductile salt to flow to areas of lower pressure–principally along fault lines. 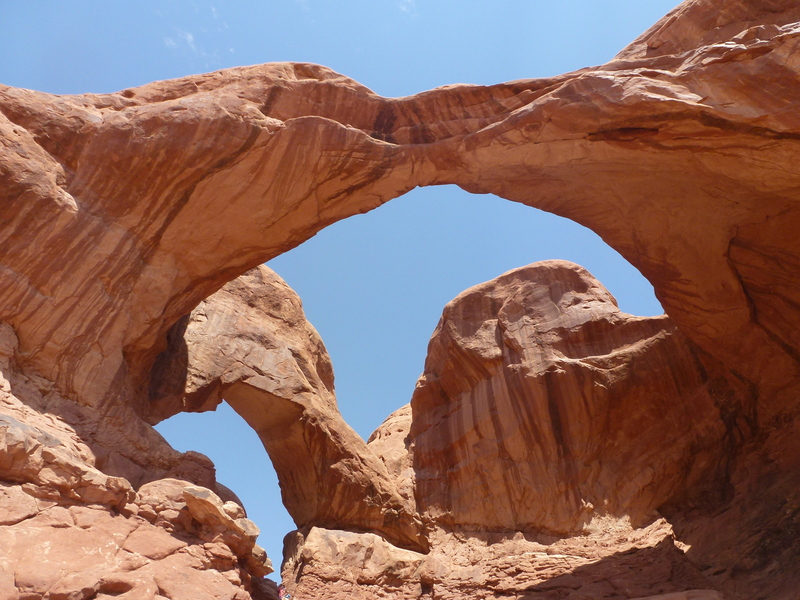 Gradually, salt accumulation or salt walls up to 10,000 feet (3050m) thick, three miles (5 km) wide, and 70 miles (110 km) long developed beneath the northwest-trending Moab and Salt Valley faults. The area between sagged in response to withdrawal of the subsurface salt. Approximately 60 million years ago, and long after the salt walls had been emplaced, compressive forces associated with the ongoing Late Cretaceous Laramide Orogeny warped the region into anticlinal folds…. Underlying the seemingly-magical, reverse-crystal-ball gazing nature of the explanation of the profusion of rock arches in a particular part of the southwestern United States then, is a whole body of scientific knowledge, acquired slowly, painstakingly, and carefully interlocked with other scientific disciplines: carbon dating, physical chemistry, materials science etc. It seems speculative to the uninitiated, but a closer look reveals that this particular house of cards has a very strong foundation indeed. You could bring it crumbling down, but you’d have to work very hard. Copyright, we see, is not essentially driven by notions of justice or theories of ownership, but by a certain culture’s attachment to a certain literary form. [T]here is still an enormous demand for the long traditional novel, for works that reinforce the idea of individual identity projected through time and achieving some kind of wisdom or happiness through many vicissitudes. There is simply no form of escapism, mental immersion, or sustained illusion quite like the thousand-page fantasy narrative…if to have that experience we have to guarantee a substantial income to its creator then society will continue to find a way to do that…. There is no such performative context for the prose thriller, or even the great American novel. None? The success of live story-telling performances should indicate there could be a thriving audience for writers willing to read out their works. Audiobooks also indicate that some folks do not mind having books read out to them. Furthermore, for a novelist, Parks seems to be lacking in imagination when it comes to thinking of alternatives to the long-form novel. Is the novel really the only kind of creative work that can ‘reinforce the idea of individual identity projected through time…’? And movie fans like me will disagree too, with Parks that ‘there is simply no form of escapism, mental immersion, or sustained illusion quite like the thousand-page fantasy narrative.’ But even if we were to grant Parks this claim, it still seems dubious that the monopoly rent model of copyright is the only way to keep ’em comin’ in. The modern novel–perhaps beginning with Don Quixote–and modern copyright regimes do not track each other quite as precisely as Parks’ thesis would seem to require. Copyright regimes have created a particular kind of political economy around the world of writing. If they are dispensed with, when the smoke clears, writers will still be writing and we, the insatiable consumers of fantasy that makes our lives more livable, will have, somehow, like good junkies, found the way to keep the fixes coming. A legal regime like that of copyright is merely a contingent, not essential, feature of that addiction. My most prominent response when watching a convention of any sort–I indict Republican and Democratic conventions equally in this regard–is disbelief that any mature adult could not see through the utter silliness of it all. Does the audience, all those shrieking, silly-hat-wearing-flag-waving folks on the floor, really buy it? Of course they do. That’s why they are there. At moments like these, it occurs to me that the only sensible way to watch a convention telecast–if forced to at gunpoint–would be to be riproaringly drunk or under the influence of hallucinogens. (I’m optimistically presuming my tormentors have a decent streak to them and will supply me with these.) The colors might be more palatable and perhaps the visual perspective afforded from my vantage position on the living room rug would make the idiot box’s showcasing of idiocy a little more reasonable. Perhaps the most dreary trope associated with conventions is that they feature ‘soaring speeches,’ stirring oratorical masterpieces, which catapult the nation’s future leaders into the political spotlight, and portend dramatic political change. What surprises me most about this is the idea that reasonable adults in this day and age could honestly get turned on by a party animal’s speech. I have responded favorably to precisely one convention speech myself: back in 1984, to Mario Cuomo‘s keynote address at the Democratic Convention. Pretty stirring stuff, sure. But I was seventeen then. I’ve grown up. And come to realize that speeches at political conventions appear to fall into two categories: off-the-wall, offensive barrages of falsehoods and posturing (best done by Republicans) and grand, pretentious, faux populist litanies packed with promises soon to be broken (best done by Democrats). Turn off the television, folks. And don’t switch it on for the Democrats either. And she sure as hell can’t take this crap any more. If you drive north-west on US-491 from Cortez, Colorado toward Utah, your route will take you to Monticello, UT. At that point, you can take US-191 south or north. 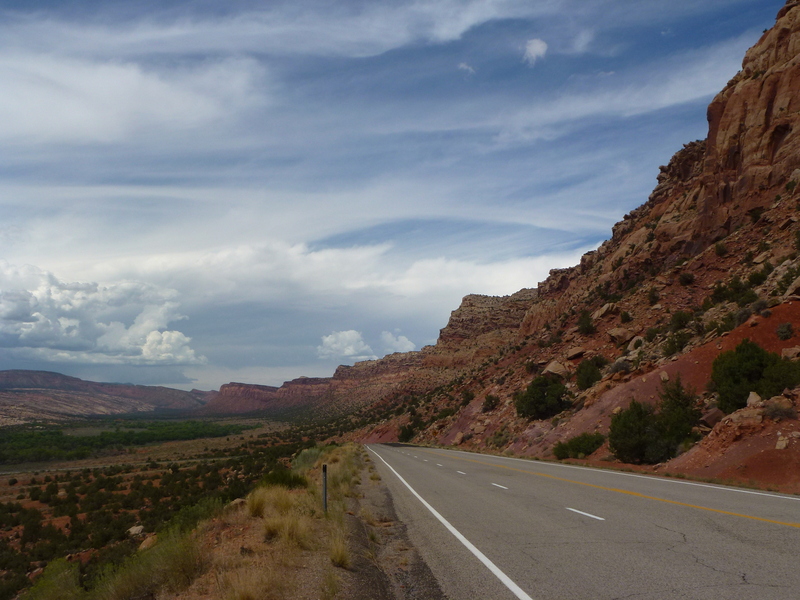 Someday you should go north on 191, for that will bring you to Moab and all of its attendant attractions. But if it is your first encounter with US-191 at the Monticello junction, then I would suggest you turn left and head south on 191 till you hit Blanding. As you drive through Blanding, you’ll hit another junction–right next to a seemingly-very-popular-with-bikers gas station–this one with US-95 heading north. Take that right turn. And sit back and enjoy one of the most spectacular drives anywhere in the world. If I have a regret about the set of photographs that I took on this section of my road-trip, it is that they do not come close to capturing what I felt was the scenic grandeur of that drive. Nevertheless, here are a couple of photos. My first reaction–besides the usual ‘Are you kidding me?’–was that I had performed the contemporary equivalent of stepping into Shangri-La. There were no other cars on the highway; the air was dry and warm; the wind blew steadily across the parched land; the desolation, grandeur and majesty of the land was awe-inspiring. I stopped the car and stared down the road – and around. I had never seen anything like this before. There are several problems with this photograph, of course: for one thing, the clipping on the left does not convey the full panoramic impact of the scene; I became obsessed with capturing the row on the right. For another, the extended walls on the right, stretching away into the distance, have been compressed and bunched together so that the sheer size of the landscape has been reduced. And then, there is too much road in the photo because I thought I’d want to capture some of the relationship between the highway that had brought us here and the land that surrounded it. Overall, I would say this is a disappointing photo. This next one, largely because of the funky light, is perhaps a little better. 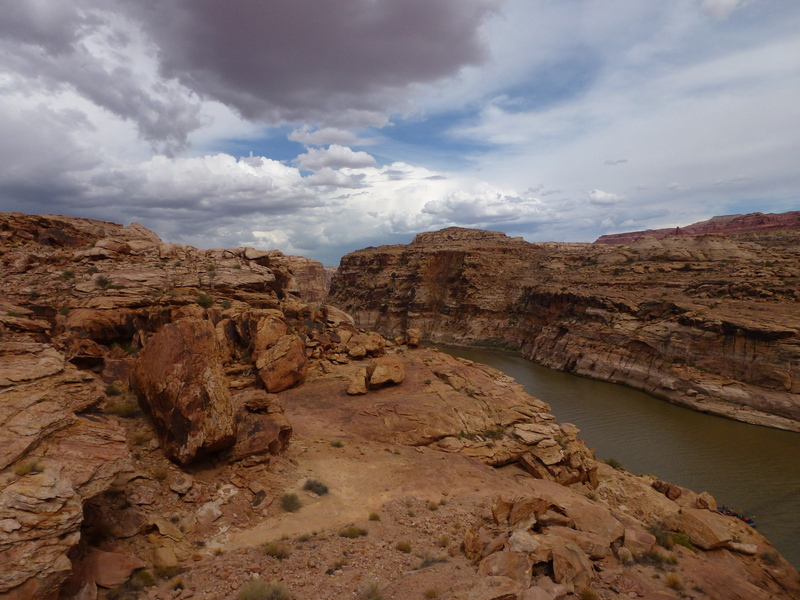 This is taken from a bridge in the Glen Canyon Recreation Area–which includes the Glen Canyon dam over the Colorado River and stretches out over the Arizona-Utah border. The foreground of the photo is problematic but thanks to the partial obscuring of the sun, whose bright lights often bleach the rock colors excessively, the landscape stands out better. As I finished taking some photographs and headed back to my car, I muttered to myself, ‘I’m not going have enough space in my camera’s memory card for all the photos I’m taking.’ I was right: two weeks later, a spare memory card still not purchased, I was reduced to capturing the Badlands in South Dakota on my phone. Landscapes like these make you want to take repeat photographs, even if, as you take them, you are profoundly conscious of the fact that you aren’t quite getting it right. Upon graduating from high school–confused and directionless–I considered taking on an undergraduate education in the US. I pursued the application process for as long as I could, before the financial impossibility of it all made me cease and desist. Among the majors I thought of making my own was aeronautical and aerospace engineering, and the school where I most wanted to study that subject was, wait for it: the University of Cincinnati. Why UC? The answer was simple: long before I had figured out the meaning of the pernicious term ‘star faculty,’ I had become aware there was a professor at UC who did have a touch of the astronomical to him: Neil Armstrong. (I did not realize then, thanks to a less-than-thorough perusal of the school’s informational brochure, that Armstrong had only taught in the school till 1979 before resigning to take up other work.) Studying aerospace engineering–a natural choice of subject, surely, for the space-exploration-obsessed son of a pilot–with the first man to walk on the moon? Dreams were made of this. It didn’t happen, of course, and I moved on to considerably less fantastic ventures. But that misguided and poorly informed attempt of mine to bring myself closer to my object of teenaged admiration should give you some indication of the kind of hold astronauts used to exert over schoolkids. The era of the space shuttle, of almost-routine spaceflight–disrupted by the 1986 Challenger and 2003 Columbia disasters–has diminished some of the halo that surrounded astronauts, but back then, only a dozen years or so after the Apollo program came to an end, they were still gods that walked the earth. And even then, Armstrong seemed a cut apart and above. And it wasn’t just that in a culture obsessed with priority, he had been the First on the Moon. Rather, it became clear to me as I read my way through the history of manned space-flight, that Armstrong was a bit of an exception even in his cohort. More than anything else, Armstrong was a nerd. In the astronaut corps, he was more test pilot than regular fighter pilot jock, more engineer than explorer. He talked a little less, swaggered not a bit, and took his missions into space to be scientific work first and foremost. Crucially, he was a civilian, which helped ensure that NASA, unwilling to take sides in the inter-services rivalry between Air Force and Navy pilots, would pick him to be the commander of the first mission to land on the moon. Armstrong’s now-legendary reticence meant he did not write an autobiography so most of what I learned about him, I learned from his Apollo 11 crewmates. (Michael Collins‘ Carrying the Fire, one of the best books written on flying by a pilot, was particularly good in this regard.) This taciturnity ensured the first man on the moon maintained a studious, discreet and dignified persona befitting his lofty title. As the outpouring of respect and affection on the announcement of his death showed, his retreat from an excessively public life ensured he would retain his Apollo 11 status in the public eye. Not for him the succumbing to the temptations of politics; I suspect he sensed cynicism and corruption lay along that path. His fellow Apollo 11 astronaut, Buzz Aldrin, had a hard landing back on earth: alcoholism and marital troubles followed. Armstrong perhaps surmised the dangers of trying to replicate on earth the glories that belonged only in space, and like the good engineer he was, made a few calculations before settling on a course of action that would best preserve his sanity, equanimity, and reputation on his return to this planet. It worked. Neil always knew when to light the fire, and when to glide to a soft landing. RIP. Returning from vacation and getting back to work is always hard. This year, returning to a three-class, ten-credit teaching load after driving some six thousand miles through New Mexico, Utah, Arizona, Colorado, Wyoming and South Dakota feels particularly onerous. Syllabi still need finishing touches, and despite my best attempts to hike as much as possible, I feel out-of-shape thanks to having pursued the good life a little too energetically on the road. But I think there is something more elemental at play. To travel to the American West is to encounter the myth and reality of what enormous, seemingly limitless open spaces can do to you: make you dream and fantasize about expansive possibility, about second chances, about dramatic personal reconfiguration. Confronting a space that dwarfs us, we respond by simultaneously acknowledging our utter significance and, crucially, imagining an ambitious response, one that at its most extreme, turns the landscape into the theater for the next act of our re-imagined lives. To return to the city feels like a regression to confinement–made particularly painful by confrontations with schedules, agendas, and timetables. Sure, in those spaces of restriction lurk chances for creative flowerings, but at the moment, they feel frustratingly elusive. I’ve spent a few hours since my return obsessing over the photographic record of my trip; my photographs, as I expected, don’t do justice what I seem to remember experiencing and feeling. But for the time being, they’ll have to do, reminders of a time just passed, when anything seemed possible, and when the promise of a stunning new vista just around the next bend did not seem overly extravagant. If my students find me a little more absent-minded than usual during the first week of classes, I apologize in advance, and will send out recall notices to that part of me that’s still dancing about on a highway somewhere out there. Note: In the weeks to come, I hope to write some posts on my travel experiences. With a photo or two. I had thought I was going to be able to post photos from my travels in lieu of blogging but that hasn’t turned out so well: one post with photos of Guthrie, OK, went up just fine, but the second post, which was supposed to showcase photos from New Mexico was an utter disaster. Frankly, I’m not feeling up to posting photos/blogging with a smartphone app while on the road. Messing around with technology’s burdens while supposedly on vacation seems like a bit of a cruel joke. I think I will lay off, and post only when it seems all too easy. Meanwhile, on the travels, we hiked to the top of Wheeler Peak–New Mexico’s highest point–today. It was a bit of a climb, from 9000 feet or so to 13,161 feet. The hike was eight miles each way and afforded spectacular views. Well worth the early start and the sore feet.